Thank you for the tips about starting to write which I appreciate. Blog time has arrived again, I feel time goes faster every year but it’s the end of February already. Today was set aside to write my blog, so I did some chores, wrote belated comments on your blogs, texted some friends, made a pot of herb tea and here I sit! Outside is sunny so should I go for a walk before I write? No my reward will be a brisk walk in cold but sunny weather later. On my windowsill is a vase of daffodils which are a promise of spring and hope. Right enough distraction! I told you last time that Hello Fresh delivered the box and it proved an interesting exercise so we have just had another one. I doubt it will be a regular event but it has taken some pressure off what to eat plus provided us with new tastes and ideas. The extra aspect is that Peter and I make the meals together with a drink and chat over various things. He tosses things with a splash of oil while I read the instructions, prep ingredients and wash up. This week we have had Paella, Toulouse Sausages with Lentils and tonight Thai Spiced Chicken with Coriander Rice and Baby Bok Choy (not tasted Bok Choy before). The Holy Basil in our previous box was very tasty with an aniseed flavour but the Mexican spices and some Asian sauces were interesting too. We have decided to try one more next month and perhaps be more adventurous in choosing alternatives. It is easy to skip a week making it simple to opt out and control when we want deliveries. This has definitely been a good time management decision. I have prioritised meeting friends this past month for lunches. Maybe I should consider Weight Watchers too if this continues! I met Tricia at The Bath Ivy where Tricia had booked a table as it gets busy. The original restaurant is in London and over the years has become synonymous with writers, actors and “the people to be seen” as well as expensive. I think the Bath Ivy must be a franchise but it is a fascinating place to people watch, one of our favourite pastimes. The mix of business people, couples, possible “liaisons” plus family groups makes an interesting mix. We had a good view of the place as I had my back to the wall and Tricia could see it all in a mirror. Champagne seemed to flow and cocktails, not for us, but we had a gorgeous two course lunch from the special offer menu. We have been friends for almost 30 years but each time we meet there is no shortage of things to talk about! Thank you my lovely friend for the encouragement and suggestions to try to write. No doubt there were probably loads of plot lines to follow with appropriate characters here but we were too busy enjoying ourselves. I feel another visit is necessary. Other highlights have been a Mexican meal prior to a performance of the St. Petersburg Ballet with my youngest granddaughter in the beautiful Theatre Royal, Bath. A visit to a French Bistro Pierre followed by an Argentine Tango show also in Theatre Royal which was amazing. My first visit to Yo!Sushi with my eldest granddaughter and yes, shopping. Street Food in Bristol with two of my grandsons and an Italian lunch courtesy of my youngest son. A range of culinary experiences and all good for the soul. No wonder the month has flown by and it’s not over yet, this Wednesday is a birthday lunch for a dear friend at an excellent French restaurant, La Flambe, near here. So What to Write – loads just do it!! Looks like you found good blog material, Jane. 🙂 I love the people-watching thing at Bath Ivy. I popped away to look at the restaurant website. It looks very chic and lovely. 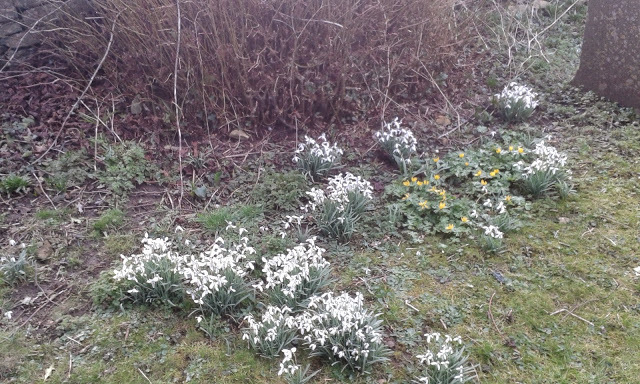 Sorry I meant to put links in, also caption on the snowdrops! I did the walk!! Totally with you on weight loss issue, keep up the good work. Definitely want to go to the Ivy again. Lovely food. Mmmm! I want to add my voice to encourage you to write. It’s added a lot to my life and even though I don’t ‘work’ at it I seem to need the creative outlet. I enjoy people watching and it always brings my grandmother to mind. It was one of Nana’s favorite past times. Sometimes I think we get ‘too busy’. Thank you Lavada, I understand the need to express yourself too. Looking forward to hearing more about your Arizona trip. Maybe you should do a travel blog. Today is glorious sunshine though cold so good time to press pause and enjoy the moment. Not cheeky, it would be great for the three of us to meet, Trish and I have talked about doing that. We’ll fix a date soon. We can do more food and people watching. Thank you for your encouragement. Thanks Jillian you are always so encouraging.